Are there situations when personal engagement can get in the way of truthful reporting? To whom the folklorist should be responsible more – the scholarly truth or the informant? What are the researchers’ responsibilities to those being studied? Are there any fields of research too sensitive and ethically too difficult to be addressed at all? What are the principles of ethically correct work with archived material and its representation in the digital tradition archives? What are the new ethical challenges introduced by the Digital Age? How the research is going to affect the lives of informants and should such influence be exerted by the results of the research? Can researchers have too much empathy? 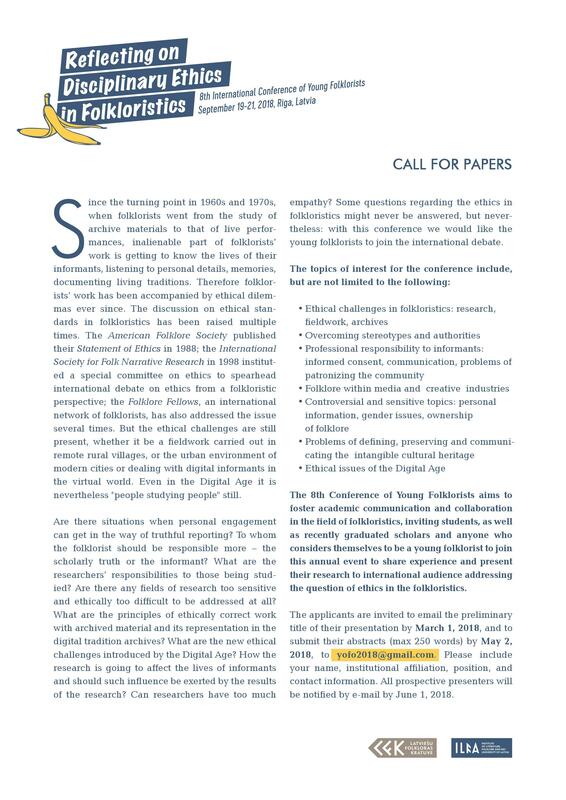 Some questions regarding the ethics in folkloristics might never be answered, but nevertheless: with this conference we would like the young folklorists to join the international debate. The 8th Conference of Young Folklorists "Reflecting on Disciplinary Ethics in Folkloristics" taking place in Riga, September 19-21, 2018, aims to foster academic communication and collaboration in the field of folkloristics, inviting students, as well as recently graduated scholars and anyone who considers themselves to be a young folklorist to join this annual event to share experience and present their research to international audience addressing the question of ethics in the folkloristics. The applicants are invited to email the preliminary title of their presentation by March 1, 2018, and to submit their abstracts (max 250 words) by May 2, 2018, to yofo2018@gmail.com. Please include your name, institutional affiliation, position, and contact information. All prospective presenters will be notified by e-mail by June 1, 2018. The conference is organized by the Institute of Literature, Folklore and Art, Archives of Latvian Folklore.